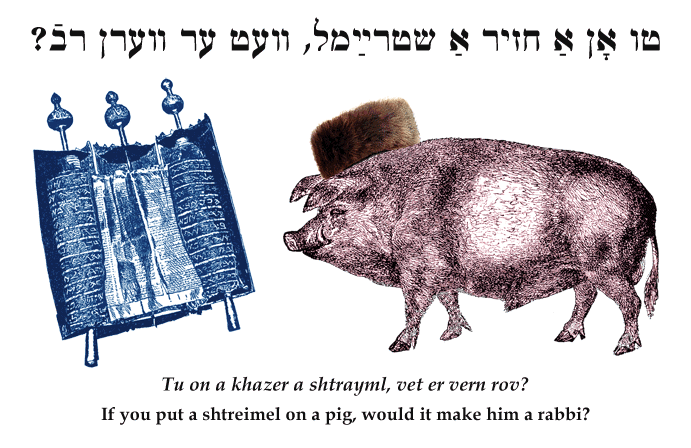 Yiddish Wit: If you put a shtreimel on a pig, would it make him a rabbi? טו אָן אַ חזיר אַ שטרײַמל, וועט ער ווערן רבֿ? If you put a shtreimel on a pig, would it make him a rabbi? SOURCE: Furman, Yidishe Shprikhverter un Rednsartn. A shtreimel is a fur-trimmed hat traditionally worn by rabbis and Hasidic Jews on the Sabbath and holidays. And of course the pig is ritually unclean.